What the Trump University playbooks really teach us. 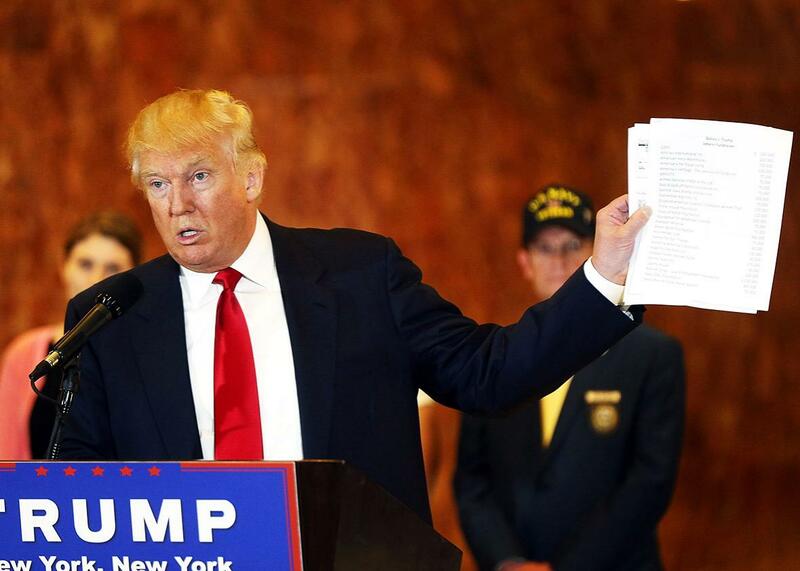 The Trump U playbooks don’t reveal much new about Trump. What they say about us is more troubling. Donald Trump addresses issues about the money he pledged to donate to veterans groups at Trump Tower during a press conference on Tuesday in New York City. The Tuesday release by a federal judge of the Trump University playbooks—manuals designed to help “instructors” encourage clients to sign up for wealth seminars with the so-called institute of higher learning—is being touted for providing insight into Trump’s way of thinking—a playbook for his campaign, even. And the playbooks do that. But we can also learn a few (depressing) things about ourselves and what we’re looking for in a leader. In one way, we learned things we already know. Anyone who signed up for a free introductory session to find out more about Trump University was a mark—oops, a target of a sales pitch—to sign up for advanced sessions that could set them back by up to $35,000. It’s the details that are so damning. In debt and need money? No debt at all? Loads of real estate experience or none at all? Trump University was for you—literally. “Always assume our attendees need the program to succeed,” says one playbook. There are rejoinders for those who fear going into credit card debt—“Do you like living paycheck to paycheck?” Worried about the cost? “It takes money to make money.” “You don’t sell products, benefits or solutions—you sell feelings,” reads yet another playbook. It goes on and on like this, for hundreds of pages. No surprise, politicians and pundits have pounced. Surely, this was just the thing to end the rise of the Donald! “Trump University Was a Scam Just Like the Trump Campaign,” proclaimed Jonathan Chait at New York magazine. “While the documents unsealed Tuesday didn’t reveal any bombshells, they did outline aggressive sales tactics that could provide further fodder for opponents’ attacks,” as Alexandra Jaffe noted at NBC. Attacking Donald Trump for being a fraud doesn’t take. We should know this by now. Sure, he’ll say whatever necessary to close the sale. But this is what his fans like about him. They think this means he’ll get things done. When I spoke with small-business supporters about Trump, they told me so. “I’ve done hundreds of deals. The last thing I am going to do is let people know what’s on my mind,” said Charles Biggert, the CEO of Nudawn Metal Fabrication in Texas. Moreover, as I pointed out last year, it’s not like Trump University—which operated from 2005-2011 and has been the subject of lawsuits since 2013—is alone in its existence. Wealth seminars—which are all that Trump University offered—are all too common here in America. Robert Kiyosaki of Rich Dad, Poor Dad fame lends his name to one, former Flip This House participant Armando Montelongo to another. Former NFL player and fellow Flip This House alumnus Than Merrill does, too. There’s a huge market for this stuff. In fact, the salesman holds a unique place in American culture. According to Walter Friedman, a historian at the Harvard Business School and author of Birth of a Salesman, Americans revere our hucksters more than traditional cultures for a basic reason: We lack an established state church or aristocracy. As a result, religions and politicians need to compete for adherents. Self-invention and sales is all we got. Politics, of course, is one of the ultimate sales jobs. Politicians promise, and they deliver—well, some of the time. It’s all but understood that sometimes, things need to be said to get things done. Remember Barack Obama’s “If you’ve got health insurance, you like your doctor, you like your plan—you can keep your doctor, you can keep your plan”? At least we got health insurance reform. It’s highly unlikely Donald Trump believes in much at all besides Donald Trump. He’ll say whatever it takes—it’s all in the playbook, after all. On this round, instead of conning people out of money, he’s working on their vote. So Trump has promised to protect Social Security and Medicare, but Sam Clovis, his chief policy adviser, told an audience last month at a conference hosted by the Peter G. Peterson Foundation he was open to cuts. He’s called his own call to build a wall with Mexico “negotiable” when meeting with the New York Times editorial board. So if the Donald says what he thinks his audience wants to hear at that particular moment? Well, it works, doesn’t it? If they want it, Donald Trump will offer it up—at least for now. Trump tells the voters what he thinks they want to hear right then. Earn millions from foreclosed homes, or ban all Muslims in the wake of a terror attack. You just need to turn something over, be it hard cash or your vote. It’s in the playbook. Will it actually happen? Does it really matter? In fact, it could be said that Hillary Clinton’s problem is not that she lies—as the common critique goes—but that she’s not a good enough shill. Her husband, after all, quickly acquired the moniker “Slick Willie,” a sobriquet that did little damage to his electoral prospects. Not Hillary Clinton. She’s too honest. Ask her a question, and she all too often actually answers it, even if that answer isn’t what you want to hear. When Scott Pelley of CBS asked Clinton, “Have you always told the truth,” would Trump have responded with, “I’ve always tried to. Always.” Do you really need me to answer that question? But let’s not end on a pessimistic note. There is a bright side here. Time ran out for Trump University. It eventually closed down. Former students sued. The sales job eventually failed. On the other hand, Trump found a new shtick.